YHOO failed to break out. LU bounced back from low of 3.12. 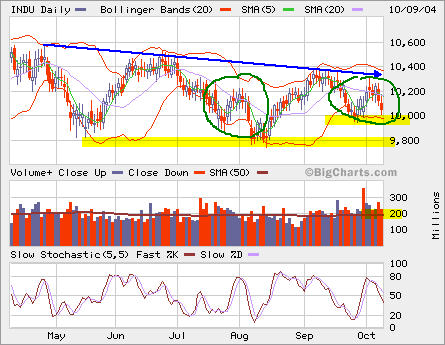 It has broken the resistence at SMA 20, which it had done last month but failed to folllow through. 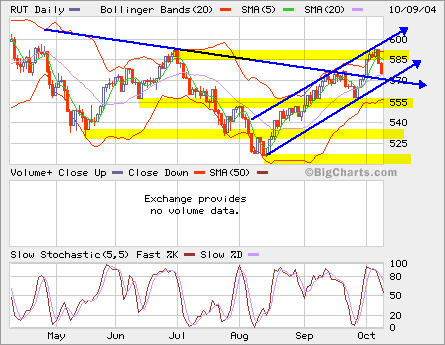 The next resistence is the downtrend line overhead, roughly at 3.5. Since HNP broke down from the triangle and formed a double bottom, it has rallied back the breaking point 30. 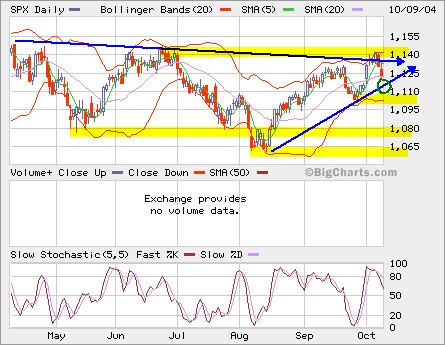 There is one point of room for it to go higher before reaching the downtrend line formed since last Sep. It does not hurt to take some money off the table now. I bought a terminator dongle on EBay to unlock my SE T610 cell phone. The first trial failed since the software didn’t work on Windows 2003 Server. I got “Phone Not Power Up” error. Then I tried DIV4 from the instruction and got “Error 101”. I switched to my laptop and it worked nicely. So I unlocked the phone and flashed it with new firmware R4C003 US3 and Standard Modem R4C003. Lastly I un-branded it so it has the OEM version of everything. During the flashing process, my laptop lost power due to used up battery:-( Luckily, everything was fine eventually. Now I have the latest firmware R6B and finally get rid of those “predefined contents” that I could not delete previously. The free memory is about 2.7MB now. 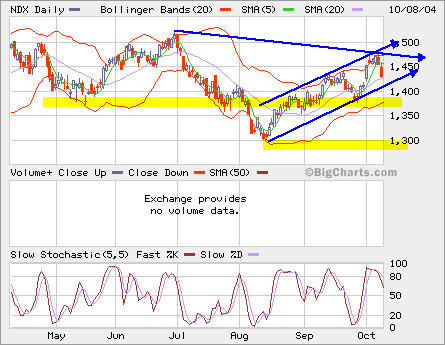 INDU backed off from the resistence just like last failed attempt to break the downtrend line. Similar actions were seen at RUT, SPX and NDX. However, if the cahnnels are held intact, they present some good entry points to go long. I’m documenting my installation experience. 1. Download mono-all.zip for RH 9.0. Here’s my first Mono Gnome/Gtk HelloWorld! Running IDE in VPC is really slow. 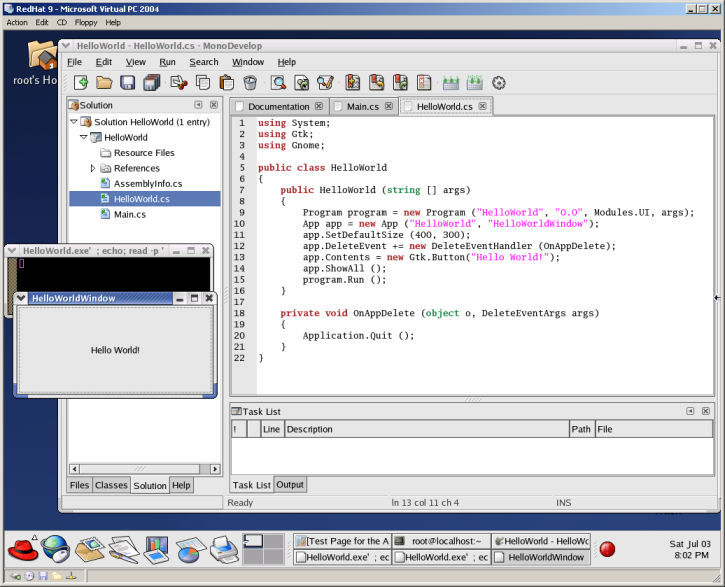 The MonoDevelop IDE is nice. I have not figured out whether or not it has drag and drop on WinForm. It took me a while to move to the next step after the installation since the monodoc web site was down and I was trying to find sample codes to test the installation. I did a find / -name “mono*” -print and found monodevelop. So I launched it from xterm. Everything works fine so far! My next step is to get ASP.NET running on Apache 2.